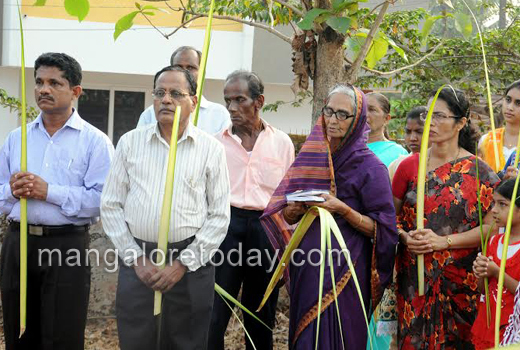 Mangaluru, Mar 30, 2015 : Palm Sunday was marked by all Churches of Dakshina Kannda and Udupi on Sunday March 29, 2015, launching the sacred ’Holy Week’ for Christians here as in all parts of the Globe. Easter will be the crowning glory in the faith of the church which will be on April 5, 2015. In particular Maundy Thursday, Good Friday, and Holy Saturday will mark solemn days during this week. 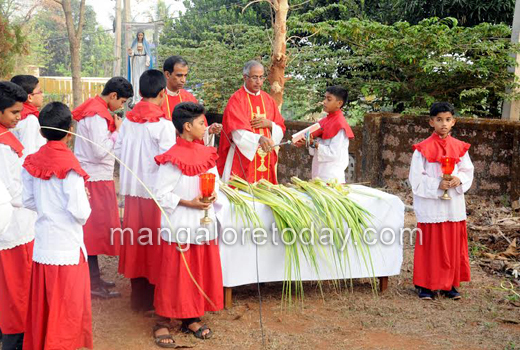 PALM SUNDAY SIGNIFICANCE : This year on March 29,2015. It signifies the triumphant entry of JESUS CHRIST in to Jerusalem along with his followers who perhaps sensed what is to follow before the Jewish passover which is observed on Holy Saturday. There was also probably one group that thought that now the ’Kingdom of Christ’ was to be triumphantly proclaimed. As directed by Jesus, an upper room was requisitioned and a ’banquet’ was held known as ’The Last supper’ which is the focus of ’Holy Thursday’ this we shall go into later. When Jesus entered Jerusalem there was a great enthusiasm and he was welcomed by his followers in great numbers. In such circumstances it was a custom to break branches from trees, particularly the olive trees and wave them in welcome. 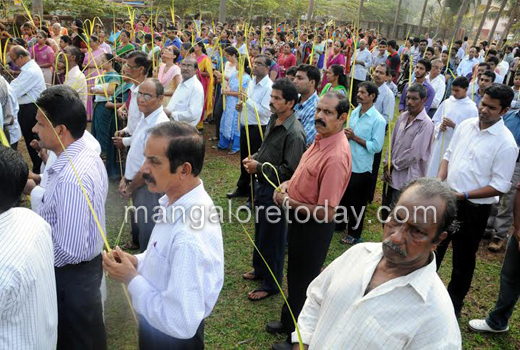 This is what is observed in all the churches in Mangalore on Easter Sunday morning with a special mass. Significantly, locally coconut palms are blessed distributed to all the faithful at spot a little away from the churches. The congregation then goes in procession to the church, palms in hand and singing hymns glorifying Christ! In old times the main refrain sung in Latin was "Hossana filio David! Vestimenta proster nibant in via, et clama bandichenthis". Meaning indicates, ’Hail the son of David! prostrate and spread your garments on the paths and proclaim his glory’. 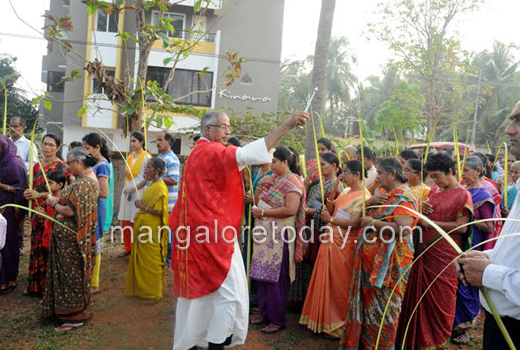 In Mangalore it’s surroundings and all over the world this day is observed as per tradition. The blessed Palm is greatly treasured by Catholics and preserved throughout the year. It said to ward off all misfortunes, evil and help the faithful. It is honoured as a safeguard against lightening strikes in particular. The remains are often burnt to ashes and used on Ash Wednesday, to be put on the fore heads of the faithful.